Morgan James Publishing, 9781642790719, 238pp. Adam Morgan, a Senior Creative Director at Adobe, gives both creatives and marketers the ammo to prove the value of creativity to stakeholders. For decades, marketers have battled over the value of creative ideas. Some believe creativity adds more impact, others believe it's just window dressing. With data-driven marketing, the divide is only increasing. 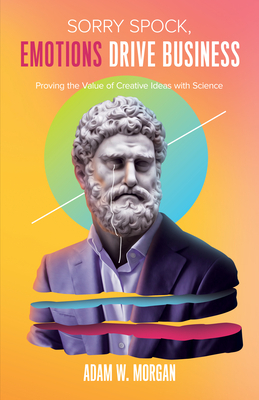 Today, more than ever, creative professionals need a concrete answer to the question, "Do creative ideas work better?" Fortunately, science has finally caught up. There is an answer that isn't based on subjective case studies. More than that, Adam shows how emotional ideas create experiences that are more effective and reveals why creativity is actually less risky for business. Sorry Spock, Emotions Drive Business shows readers how they can create the ideal experiences to improve their bottom line.